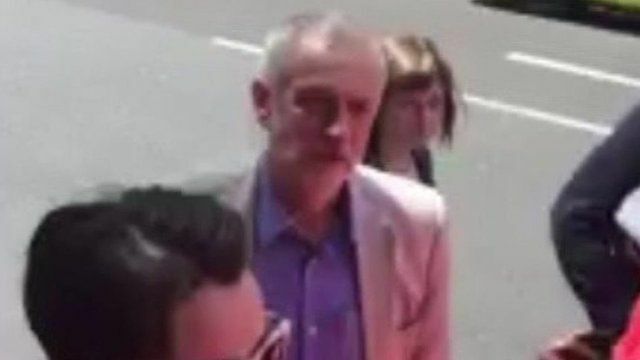 'Your fault, Jeremy' - Corbyn heckled Jump to media player The Labour leader Jeremy Corbyn is heckled over the EU referendum result while attending the Pride in London march, replying "I did all I could". Tears in town that voted Leave Jump to media player The BBC returns to Romford, one of the most Eurosceptic towns in the UK, to catch up with single mum Fay who fiercely wanted to remain. Newsnight exchange with Brexit MEP Jump to media player Newsnight's Evan Davis had a tense exchange with MEP Daniel Hannan over free movement. 'I just woke up to Nigel Farage grinning' Jump to media player Six young voters recorded the moment they found out the EU referendum result on Friday morning. When no. 28 found out about Brexit Jump to media player The BBC followed the Barnes family as they prepared for the EU referendum, and discovered its outcome. Albarn: 'We will change Brexit result' Jump to media player Singers Damon Albarn and Billy Bragg say they are dismayed by the outcome of the EU referendum. Protester and dog disrupt BBC Breakfast Jump to media player A protester and his dog have disrupted BBC Breakfast's live broadcast from Westminster. Jeremy Corbyn has been heckled by Labour activist Tom Mauchline over the EU referendum result while attending the Pride in London march. He was accused of failing to convince his party's supporters to back the Remain campaign, but replied "I did all I could".